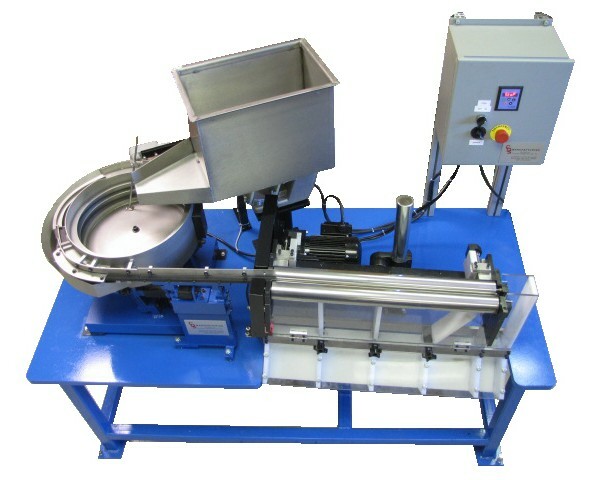 CDS Manufacturing’s standard base mounted Roll Sorter, also known as ‘roller sorters’ and ‘roller micrometers’, is equipped with a bulk hopper, a vibratory feeder system, a pair of 24″ case hardened stainless steel rollers, adjustable roller height and angle, locking roller adjustments, adjustable fallout baffles, five stainless steel storage bins, and roller speed controls. 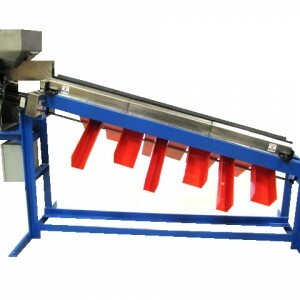 The entire system is mounted on a heavy duty machine base. The operator adjusts the rollers to attain the desired fallout and then loads parts into the bulk hopper. The bulk hopper supplies parts to the vibratory feeder system. 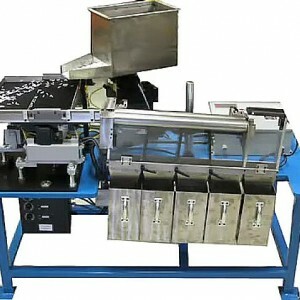 The number of parts in the feeder system is automatically maintained. Parts are fed to the rollers. Parts travel the length of the rollers and fallout at the predetermined locations. Adjustable baffles fine tune the parameters of the fallout. Sorted product exits the system to five hanging storage bins. Output chutes are also available.